With 86 post-secondary institutions available to those seeking an education in Washington, it is an understandably daunting process to choose just one. Prospective students must decide between a two-year or four-year school, but the decision making does not end there; other important factors to consider include retention rates, tuition cost and financial aid availability. 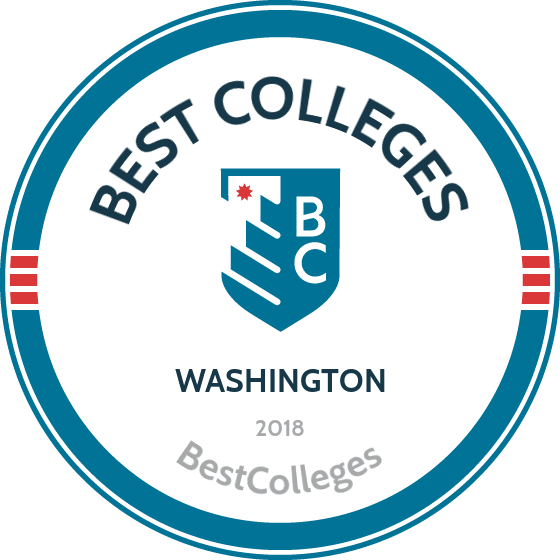 To assist you in your search, we have applied our rigorous methodology to the latest education data to rank the best colleges in Washington, including the top four-year and two-year schools. Using our comprehensive algorithm, each institution has been ranked according to essential factors and scores, giving you a head start in this important process. Washington is home to some of the nation's most acclaimed four-year institutions. Although the state does not have an official university system, the University of Washington is considered a public ivy, and was ranked #12 in the country by Forbes in 2015. Among its 20 private and public bachelor-granting institutions, several of these are considered the most competitive in the nation, according to a recent NY Times article. However, students who do gain admission to a four-year school can be assured of reasonable tuition rates; the Washington state Senate recently passed a bill to reduce public university costs to a lower percentage of the state's average wage. Additionally, the state has extensive resources in place to help attendees secure scholarships and financial aid, such as the College Bound program, which assists lower-income undergraduates with books and tuition. We have compiled the list below to help guide you through the decision making process. UW, located in Seattle, ranks as one of the best colleges in Washington. The student body is comprised of 136 Fulbright Scholars and 35 Rhodes Scholars, proving the students accepted to the UW are some of the brightest students in the country. Offering 165 different majors from American Ethnic Studies to Neurobiology, the UW makes an effort to cater to all of its students needs and interests giving them choice, opportunity, and freedom to explore. The UW experience offers the opportunity to become a master in various degrees. The school separates itself by prioritizing its Husky Leadership Initiative. This initiative facilitates student leadership education in and outside the classroom, providing the necessary knowledge for students to make their positive contribution in the world after graduation. The school is part of the Running Start Program, allowing 11th and 12th grade high school students to enroll in some college courses and earn dual credit. Whitman prides itself on providing an education that goes beyond the classroom, helping mold students into scholars, explorers, and scientists. Students have the opportunity to choose from majors across 45 departments and programs and the chance to create new interdisciplinary areas of studies to best fit their interests. Students can major in Politics-Environmental Studies, Japanese, Philosophy, and other programs. Whitman's emphasis on preserving the environment shows in its academic offerings which include over five specific Geology majors with different tracks such as astronomy, environmental studies, and physics. Campus life at Whitman is extremely active with their Outdoor Program being one of the best in the nation offering weekend trips that include kayaking, hiking, climbing, rafting, and more. Over 70% of the student body participates in intramural sports. Whitman's facilities, educational offerings, and overall values rank it as one of the best colleges in Washington. Innate curiosity and a relentless pursuit of solutions combined with an exemplary education pushes Gonzaga students above and beyond what they thought was possible. Students enter the world as courageous leaders, serving their professions and communities to make a positive impact on the lives of those around them. Gonzaga faculty are leaders in their fields, and their contributions advance how their discipline is understood, taught, and used in a complex and rapidly-changing world. Together with professional staff, they prepare students to thrive in their educational, career, and philanthropic endeavors. A Jesuit-inspired, liberal arts-based tradition of reflection and action ensures development of the whole person -- mind, body, and spirit -- in equal measure. Offering 43 majors with an average class size of 23 students, Gonzaga prepares learners with the necessary knowledge to succeed in their field of study while emphasizing the value of the written word throughout all disciplines. A close-knit community of students, alumni, faculty, and staff share a commitment to help others, creating an unrivaled fellowship on campus and beyond. This distinctly Gonzaga experience fosters a mature commitment to dignity of the human person, social justice, diversity, intercultural competence, global engagement, solidarity with the poor and vulnerable, and care for the planet. UW-Bothell is founded on three distinctive practices: Cross - Disciplinarity, Connected Learning, and Community Engagement. Cross Disciplinarity refers to the faculty collaborating to ensure students connect all subjects and embrace various perspectives. Connected learning emphasizes the necessity of human social networks to learn and includes teaching circles and learning communities. Community engagement focuses on moving creativity to action through the collaboration of people within the campus and greater community. The UW Bothell is one of the most diverse college campuses in the nation with 46% of students being of color. It is also one of the fastest growing four year colleges in Washington state, with 27 of the 45 degrees and programs added in the past five years. Unique to the 128-acre campus is the environmentally friendly buildings that were designed to complement the land's natural beauty, overlooking the protected wetlands and the Cascades. A diverse student body, in which 80 percent of students transfer in from nearby community colleges or other universities, embodies the community at UW-Tacoma. Students include freshman from high schools across the Puget Sound, adults returning to school after years away, and military personnel and their families, creating a learning community full of different perspectives and life experiences. With over 40 majors to choose, students at UW-Tacoma have the opportunity to pursue various interests and learn in a small class setting from professors who believe in a collaborative, creative learning process. The first year curriculum includes a foundation of four core courses that students will take throughout the year in groups of about 25. The Teaching and Learning Center at UW-Tacoma provides students, faculty, and staff with resources to develop skills, strategies, knowledge, and confidence necessary for success. Their services include tutoring/drop-in consultations in writing, math, science, and statistics, and support for faculty. Western Washington offers an experience where students get the best of both worlds. Students to reap the benefits of a large school while still receiving the attention and access to faculty that a smaller school provides. Offering over 160 academic programs, Western Washington University strives to provide students with the necessary resources for success in the field of their choosing. Programs include journalism, Plastics and Composites Engineering, and environmental sciences. A unique aspect of the WWU experience is its Bellingham location; the campus is surrounded by water and mountains. Students benefit from an urban community, a live music scene, and a unique food culture while living in a natural setting. The school offers many programs for students to further their learning with a weekend MBA program, an RN-BSN program, a TESOL certificate, and an online college. The school's Viking Union aims to engage students, faculty, and staff to help in building a diverse community. Over 90% of students at Puget Sound receive need-based financial aid or merit scholarships, proving this university's commitment to giving students access to its liberal arts education. This includes the university's well known School of Business and Leadership and the competitive conservatory-caliber School of Music. Students usually declare their major in their second year at Puget Sound, and many choose to double major; truly taking advantage of the opportunities Puget Sound offers. The majority of students live on the 97-acre campus, cultivating a close community feel with amazing facilities, including a new Athletics & Aquatics Center with a 25-yard pool and expanded fitness center that opened in August 2016. Being the only independent national undergraduate liberal arts college in Western Washington, Puget sound differentiates itself, adding to its list of reasons why it is one of the best colleges in Washington. Life-changing research occurs every day at one of the best colleges in Washington, WSU, where the faculty includes members of the National Academies. This research includes a partnership with Alaska Airlines; the coalition is developing a fuel made from forest residuals to power commercial flights. Research also focuses on predicting the progression of cancers. Students at WSU are not limited to research, they have the choice of 95 undergraduate majors, 86 minors, and the opportunity to do fieldwork, internships, and in-depth labs. The university truly wants to make a difference in the world, starting by contributing to the state's clean technologies industry in fields including: aviation biofuels, smart grid, advanced composite and bio-based materials, and others. This commitment to clean technologies earned Washington State University the CleanTech Achievement Award in 2015. A range of master's, doctoral, and professional programs are available in Education, Veterinary Science, and more. One of the best colleges in Washington, Seattle offers its 4,800 undergraduate students more than 60 program choices and a chance to receive a Jesuit education. Four modules structure the university's core curriculum: engaging academic inquiry, engaging Jesuit traditions, engaging the world, and reflection. These modules prepare students to succeed in their chosen majors and broaden their perspective through interdisciplinary discourse. Unique to Seattle University is their pre-major program, giving students who are unsure what they want to study the flexibility to explore their options. These students participate in a two-year program where they build a foundation in liberal arts while discovering their various academic interests. Seattle University strives to make every student as comfortable as they can through the transition of becoming a college student. The Office of the Dean of Students commit their time to ensure all students find the necessary resources to fully engage and succeed while at the university. Since its founding in 1890, Pacific Lutheran, located in the Parkland neighborhood of Tacoma, Washington, continues to educate students through the tradition of Lutheran higher education. PLU maintains this tradition while continuing to search for ways to innovate and improve the education they offer to maintain their status as one of the best colleges in Washington. This focus is seen through being the first American university to have Study Away classes on all seven continents and being the first private university on the West Coast to receive the Senator Paul Simon Award for Campus Internationalization. The school is home to an Emmy Award-winning MediaLab and a MacArthur Award-winning detachment of Army ROTC. Offering 44 rigorous liberal arts and professional programs to 3300 students, PLU ensures its students a hands on learning experience that includes research, internships, lab work, and more. Ninety percent of recent graduates from PLU were either employed or accepted into graduate school within six months. Affiliated with the Seventh-day Adventist Church, Walla Walla University welcomes students from all backgrounds with a desire to receive an exceptional Christian education. The university offers more than 100 areas of study in liberal arts, professional, and technical programs, priding themselves on small classes, personalized attention, and outstanding professors -- of which 72 percent hold doctoral degrees. The biggest undergraduate programs are the nursing, engineering, business, biology, and education programs. Walla Walla University dedicates an entire office: The Office of Student Life and Mission, to provide a growing Christian community that creates a culture which prepares students for Christ-inspired leadership roles. It also provides Freshman with a mentoring program, assigning them a trained mentor who checks in every week and provides them with resources necessary for their overall success at one of the best colleges in Washington. The school offers master's and associate programs. Convenience and flexibility, relevant programs, and an adult learning environment are all reasons students choose to study at one of the best colleges in Washington, City University. Their programs cater to the working adult and student who cannot leave their jobs to get the degree they aspire. The school offers degrees in areas of study including business and management, teaching and education, and computer and info systems. Programs are also popular among international and military students. CityU is designed for adults/students who want to invest in their career by gaining the most current knowledge in their field and receive a degree or certificate. Through their practitioner model and practica, City U is able to provide a sense of real life situations to their students before they graduate and start their careers. CityU offers many resources including a career center, counseling center, student clubs, and academic advising. Whitworth created a Four-Year Graduation Guarantee Program stating that the university will ensure eligible students graduate in four-years. If for some reason the student meets all of the criteria yet is unable to graduate, the university will cover 100 percent of tuition needed for any additional courses required for graduation. This unique program demonstrates the confidence Whitworth has in their faculty advising, dynamic scheduling, and individual attention needed to guarantee students will graduate in four-years. Students receive "an education of mind and heart" at Whitworth, based on academic excellence, opportunities to engage in research, service, and the integration of faith and learning. Professors at Whitworth are top scholars in their fields, making it one of the most academically selective universities in the Northwest. These professors provide immense knowledge of their field and go above and beyond to connect students through service-learning, research, and study abroad opportunities. Whitworth offers a rare experience to combine faith and education while attending a prestigious university, making it one of the best colleges in Washington. RTC, one of the top technical schools in Washington, offers associate degrees, certificate programs, and bachelor's degrees. At the associate level, students can pursue programs such as culinary arts, kitchen major appliance repair technology, land surveying technician, and anesthesia technologist. Many of the school's associate programs are transfer degrees that prepare students to pursue a bachelor's degree. Other degrees are terminal programs that prepare graduates to enter the workforce immediately upon completion. RTC also offers two bachelor's programs in application development and computer network architecture. All campus students have access to the Learning Resource and Career Center, which offers career counseling and three types of academic tutoring. The center's career services helps students build pathways between academic learning and potential career paths. Career advisers help students with resume guides, career exploration, career fairs, and connections to job opportunities. Seattle Pacific combines outstanding scholarship and faith to bring about change in the lives of their students and the people and communities these students serve after graduation. Located about 10 minutes from Downtown Seattle, SPU's campus borders the Lake Washington Ship Canal and boasts views of the Cascade mountains. The school has cutting-edge science buildings, a four-story library/study center, a restaurant like dining facility, coffee shops, and five residence halls. The Office of Student Involvement and Leadership commits itself to offer various features to help build and maintain the community at SPU, including residence life and housing, student programs, multi-ethnic programs, and athletics. Classes at SPU average 22 students, allowing professors to know students by name and create an experience for academic excellence, a unique factor not often found in other Washington Colleges. The school has many majors and minors in liberal arts and theological studies. Eastern Washington is the only college in the country with a research facility in a national wildlife refuge, further differentiating itself from other Washington colleges and universities around the nation. Its location in the small college town of Cheney, Washington, is minutes away from 20 different lakes, mountains, and parks, allowing students the opportunity to embrace the active spirit of the Pacific Northwest. Eastern is now the fastest growing public institution in Washington, seen through increased applications and physically through the structural changes around campus, including the Recreation Center, home to a NHL-size hockey rink, climbing wall, sports courts, and fitness center. The university offers an education that will prepare students to succeed in today's work environment including in-demand disciplines in biotechnology, cyber security, children's studies, and urban planning. Through its academic advising, academic success center, and eastern advantage programs, EWU provides the necessary resources to ensure students success. Northwest, founded in 1934, has built a community dedicated to spiritual vitality, academic excellence, and empowered engagement with human need. Grown to include over 70 majors and programs and off campus internships, Northwest's undergraduate experience ensures all students are provided with the necessary knowledge for success. Programs offered range from Youth and Family Ministries to Intercultural studies, attracting a diverse range of students. Over 70 percent of Northwest students participate in on campus classes and are involved in off-campus internships. This allows students to take what they learn in class and apply it to real world situations. One of NU's oldest traditions is Screaming Eagle Week, it begins with a massive game of dodgeball, a tradition that allows students to come together for fierce competition and a chance to make new friends. A vibrant community, wide range of opportunity, and an extensive alumni network all contribute in making Northwest University one of the best colleges in Washington. Home of the Wildcats, Central Washington University's commitment to hands-on learning, discovery, and individual attention ranks it as one of the top colleges in Washington. Its partnerships with 30 colleges and universities around the world provide students with the opportunity to succeed in a global economy. CWU is known for its distinguished music, geology, physics, and education programs. It strives to cater to all students by presenting more than 135 options of majors and by maintaining an average class size of 25. Students at CWU have the opportunity to pursue their interests with access to individual help from professors themselves. The Wildcats compete in 13 sports in the Great Northwest Athletic Conference and are nationally ranked in football, basketball, and rugby. More than 30% of students participate in intramural sports, creating a close community full of school pride. Master's programs include education, chemistry, and primate behavior. With an enrollment of more than 37,000 students, BC is one of the largest public colleges in Washington. The school occupies two campuses in Bellevue, just outside of Seattle. Students can pursue associate, bachelor's, and certificate programs in a wide variety of technical, professional, and academic subjects. BC's associate programs are available as terminal degrees and transfer programs. The school offers more than 100 programs in many popular fields, including business, education, health, science, and arts. Notable programs include alcohol and drug counseling, movie making, and oceanography. BC offers its bachelor's degrees in partnership with respected four-year schools around the state, including Washington State University, the University of Washington, and Eastern Washington University. Students can choose from several unique bachelor’s degrees, including interior design, digital marketing, radiation and imaging sciences, and molecular biosciences. BC also offers several programs for high school students, including dual enrollment and summer enrichment. Cornish College, located in Seattle, Washington, is one of the only Washington colleges to solely offer Bachelor of Fine Arts degrees in the performing and visual arts. The many teaching artists believe in an education that exposes students to all the arts, shaping the college's curriculum and community involvement. Visual arts degrees include art, design, film and media, and interior architecture. Performing arts degree incorporates dance, music, performance, and theater. Cornish created The Student Life Staff to provide an environment that supports student's success and offers programs and services that specialize on student development. Students who attend Cornish will learn from actively involved professional artists, who teach and usually become incredible mentors. Faculty and staff at Cornish emphasize helping students find their own artistic voice; once learners graduate from Cornish they will have an individual artistic vision in place. Known Cornish alumni includes actor Brendan Fraser, actor Jane Adams, and choreographer and dancer Merce Cunningham. Two-year institutions in Washington provide services, degrees and transfer pathways to over 400,000 students each year across 34 campuses in the state. An associate's degree can be a great platform for transitioning to a four-year university, or provide a skill-based career jumpstart; regardless of your end goal, Washington is a great place to pursue one. A 2016 budget plan includes expansion of community college MESA (Math, Engineering, and Science Achievement) departments to help supplement the state's rapidly-growing technology workforce. Additionally, the state boasts a stellar transfer rate: nearly 40% of all Washington baccalaureate grads start at a two-year institution. Below is a collection of the top colleges to assist you in your search. South Seattle College works hard to help its diverse student body succeed in their education and career goals. Students can pursue a vast array of associate degree and professional certificate options, including the Landscape Horticulture or Wine Marketing and Sales programs. Additionally, South Seattle College offers several bachelor's programs, such as the popular Bachelor of Applied Science in Hospitality Management degree, which provides preparation for those interested in management positions in the hospitality industry. Among the best community colleges in Washington, the South Seattle College campus houses numerous attractions that play dual roles as learning opportunities. The college's Arboretum, for example, was designed and installed by students in the horticulture program and was designated a National Wildlife Federation Urban Wildlife Sanctuary in 2012. Additionally, the WorkSource Career Center helps students search for gainful employment. Though it's located close to downtown Seattle and the University of Washington, North Seattle College's campus also includes a wetland environment that reflects the institution's commitment to ecological responsibility. North Seattle offers excellent associate degree options, and it is especially recognized for its outstanding science and engineering programs, which train students in fields like nanotechnology, sustainability, and even watchmaking. Not only that, but students can complete Bachelor of Applied Science degrees in International Business, Early Childhood Education, and Application Development. As a member of the Washington Community College Consortium for Study Abroad, North Seattle joins a group of fifteen two year colleges in Washington in offering quality international programs. By studying abroad, North Seattle students can enjoy cultural studies in countries like England, Peru, Costa Rica, Japan, and more. On campus, students can contribute to numerous cultural activities, including the Licton Springs Review, North Seattle's exceptional literary magazine. Seattle Central College instructs students in over 30 associate degree and professional certificate programs. These programs encompass many emphases, such as the Associate Degree in Applied Science in Sustainable Agriculture, which investigates the ways culture, economics and politics influence food systems. Students at Seattle Central College can also choose more hands-on programs, like the certificates and Applied Science degrees offered in woodworking and carpentry. Seattle Central Students can even finish a four-year degree through the Bachelor of Applied Science programs in Allied Health, Applied Behavioral Science, or Information Technology-Networking. Seattle Central College is one of the most diverse two year colleges in Washington, with over half of its student body identifying as people of color. The campus also hosts a variety of restaurants, such as the Buzz coffee shop, the Atrium, and One World Restaurant, a seasonally-focused eatery catered by the college's culinary arts students. Out of all community colleges in Washington, Centralia College is the oldest continuously operating institution. Centralia College's Associate of Earth Science is especially notable, as it includes concentrations in the diverse fields of the discipline, such as geology, oceanography, or astronomy. Additionally, Centralia's Associate of Liberal Arts degree develops broadly applicable skills like critical thinking and logical reasoning, while its Bachelor of Applied Science in Teacher Education offers an affordable track for aspiring elementary school teachers. Centralia College is home to the unique Center of Excellence for Clean Energy, which fosters the economic development of clean energy through numerous grants, projects, and partnerships. The college also has a proud athletic tradition and competes in basketball, baseball, softball, golf, and volleyball in the Northwest Athletic Conference. Student athletes will enjoy access to the remodeled Centralia College Health and Wellness Center, and will soon utilize a newly remodeled, state-of-the-art weight room. Like the Puyallup campus, Pierce College's Fort Steilacoom campus distinguishes itself from other Washington state community colleges in its commitment to innovative learner engagement. An example of this innovation can be found at the campus' Science Dome, a nearly 60-seat planetarium that conducts live astronomy presentations. Students can also benefit from the campus' multi-million dollar Health Education Center, which uses state-of-the-art technology to provide hands-on instruction in fields like kinesiology. Transfer students at Fort Steilacoom can pursue an Associate of Arts and two versions of the Associate of Science degree: one which focuses biology, earth science, or chemistry, and one which targets engineering and computer science. When not in class, students can enjoy a thriving arts culture by participating in numerous musical performance groups, theatrical productions, a student newspaper, or the literary arts magazine. Additionally, students can use Fort Steilacoom's low-cost Dental Hygiene Clinic for affordable dental care. For more than 50 years, Highline College has been a standout among community colleges in Washington. In addition to offering associate degrees and certificates in everything from from architecture to urban agriculture, Highline gives students the opportunity to complete their bachelor's education without leaving campus. The Bachelor of Applied Science in Cybersecurity and Forensics degree is particularly notable, as its faculty includes Dr. Amelia Phillips, a nationally recognized expert in the field and a Fulbright Scholar. In 2016, Highline College received the prestigious Higher Education Excellence in Diversity Award in honor of its outstanding to commitment to fostering diversity on campus. With only 25% of the school's student body identifying as Caucasian, the award is certainly well-earned. Highline College is particularly strong in giving students flexible learning options, offering a generous selection of online, hybrid, and evening courses alongside its traditional daytime classes. Even though it's the newest of Washington state community colleges, Cascadia College already has a reputation for academic excellence. Cascadia is known for its active learning philosophy, which prioritizes hands-on academic experience, and offers numerous associate degrees, including the highly popular business and pre-nursing programs. The college even offers bachelor's degrees in disciplines like sustainable practices. Additionally, Cascadia students can complete the highly unique Associate in Integrated Studies, which is a multi-disciplinary degree ideal for those seeking to transfer to a four-year liberal arts program. Located on land originally occupied by a ranch, Cascadia College's campus is committed to sustainability and hosts features such as solar panel installations, a LEED Platinum building, and a protected wetland habitat. However, Cascadia's beautiful setting doesn't deter students from exploring the world: the college supports a variety of popular study abroad programs to countries including Spain, Australia, New Zealand, and Costa Rica. Founded in the 1930s as a tribute to the late Yakima businessman John Perry, Perry Technical Institute provides instruction in 12 unique and highly practical programs in technical and manufacturing fields. Perry's certificate programs include the one-year Welding Technology Program, while the Associate in Applied Science in Business Technology and Accounting equips students with the skills necessary to succeed in the dynamic and constantly changing modern office. Overall, Perry is proud to provide quality education at an efficient pace. Perry's campus works hard to support the varied needs of students at Washington state community colleges. The Perry Pantry gives students short-term emergency food assistance, and the Harriet Circle is a support group for female students pursuing degrees in the trade and technical industries. Located 20 miles from the Canadian border, Northwest Indian College is the only accredited tribal college that serves Idaho, Oregon, and Washington. The college resides on the Lummi Indian Reservation and offers associate degrees, certificates, and vocational programs. Available associate degrees include business, pubic and tribal administration, chemical dependency, and information technology. The 90-credit associate of technical arts provides learners with a two-year credential that emphasizes technical skills in the field. The institution is unique among community colleges in Washington, due in part to its catalog of bachelor's degree programs. Students may pursue a four-year degree in native studies leadership, community advocacy, native environmental science, or tribal governance and business management. Students also learn about tribal communities through experiential learning, engagement in the community, and work with tribal leaders in communities that the school serves. Among Washington state community colleges, Tacoma Community College is particularly committed to a diverse, global perspective: in addition to over 60 areas of transfer study, students can pursue an Associate of Arts degree in World Languages, which can prepare for specialization in Chinese, Spanish, German, Japanese, or Arabic. Also, students can pair a certificate in American Ethnic and Gender Studies, a multidisciplinary program drawing from departments across the college, with their associate degree. The campus itself includes a Japanese Friendship Garden to celebrate the Japanese-American culture of the Puget Sound, and over 40% of the school's students identify as people of color. As a member of the Northwest Athletic Conference, Tacoma Community College competes with over 30 other community colleges in baseball, basketball, soccer, and volleyball. Additionally, aspiring artists can publish their writing each spring in the college's annual magazine, Una Voce. Bellevue College is the third largest college in the state of Washington. The school serves many students from the Bellevue, Issaquah, Snoqualmie Valley, and Skykomish school districts with two-year and four-year degrees. Students can pursue associate degrees in business professions, communications, technology, education, health care, and public safety. BC, one of the top community colleges in Washington, offers bachelor's degrees that can be earned through the school and its partnerships with the University of Washington, Eastern Washington University, and Washington State University. Available baccalaureate degrees include interior design, applied accounting, data analytics, and radiation and imaging services. Students working on a two-year degree that is designed to be transferred to a senior college may enroll in one of six degrees, including the associate in business, associate in math education, and associate in arts and sciences. Green River College is located on a forested campus in Auburn, with satellite sites in Auburn, Enumclaw, and Kent. The school's degree programs emphasize rigorous academics, experiential learning, and opportunities for networking. Students may pursue associate degrees in fields such as accounting, business, early childhood education, medical office administration, and criminal justice. Green River, one of the top community colleges in Washington, offers unique programs such as 90-credit associate in science for transfer degrees in atmospheric science, earth science, and physics. The AS-T degrees are easily transferred towards a baccalaureate program at a four-year college. The school also offers bachelor of applied science degrees in forest resource management, aviation technology, and network administration and security. Students may enroll in programs at Green River on a full-time or part-time basis. Originally operating out of a former elementary school, Everett Community College now serves nearly 20,000 students at locations throughout Snohomish County. At Everett Community College, students can earn certificates and associate degrees in divisions like Aerospace and Advanced Manufacturing, Arts and Learning Resources, Business and Applied Technology, and more. More specifically, students can study disciplines as conventional as English and as unique as diagnostic ultrasound. When students aren't in class, they can enjoy Everett's vibrant athletic culture, which includes men's and women's teams in soccer, basketball, and track and field. Everett is particularly committed to serving a diverse student body and veterans. With students of color accounting for about a third of its student body, Everett is one of the most diverse community colleges in Washington, and the campus supports a Diversity and Equity Center to foster multiculturalism. Additionally, the campus' Veteran's Resource Center provides extensive aid to veterans in pursuit of their degree. Spokane Falls Community College is one of the best community colleges in Washington when it comes to instruction in the arts, and it's estimated that nearly 75% of the student body is enrolled in a liberal arts program. Students earning a transferable Associate of Arts in Fine Arts degree can focus on music, drama, or art. Through the Associate of Art in Communications Arts, Modern Languages, and Drama, students plunge into the liberal arts by studying drama, communications, film, and a foreign language. The campus' International Language Center provides extensive resources for foreign language students, such as peer-tutoring in French, Japanese, and Spanish. Spokane Falls is part of the national Gateway to College program, which helps individuals from ages 16-20 finish high school degrees that may have been put on hold. The college also runs the Work First/Worker Retraining program to aid unemployed workers through extensive career planning, counseling, and job placement assistance. Columbia Basin College serves residents in Benton and Franklin counties with programs designed to prepare students for in-demand jobs or to transfer to senior colleges. Students participate in hands-on learning with applied degrees and certificates in the trades, technical fields, and health sciences. The college also offers traditional associate degrees in fields such as business administration, computer science, engineering technology, and nuclear technology. While CBC features associate degrees that can be transferred to four-year colleges, it also offers bachelor degrees in fields such as nursing, dental hygiene, applied management, and information technology. Students may complete their GED or high school diploma at CBC, or learn English as a second language. Columbia Basin, one of top schools in Washington, has developed strong apprenticeship programs with partnering organizations in carpentry, electrical line working, plumbing, and aerospace technology. The school has two health science centers and a social science and world languages building. Olympic College enrolls more than 13,000 students each year through campuses in Bremerton, Shelton, and Poulsbo. Students can earn a one-year certificate or a two or four-year degree. Associate degrees may be earned in the trades or technical fields such as biotechnology, manufacturing, welding, and computer information systems. OC's associate programs boost their stature as one of the leading community colleges in Washington. Degrees include the associate of arts or associate of science in astronomy, atmospheric science, and marine science. Students earning a transfer degree can pursue the associate in arts-direct transfer agreement, which includes 60 credits in general education and 30 credits in major-specific electives. Learners may then transfer to one of 22 partnering colleges. OC offers baccalaureate degrees in computer information systems, filmmaking, nursing, and organizational leadership. Learners can earn their GED, high school diploma, or continuing education credentials through the school. Everest College's Everett Campus caters to students who need to train for careers in the fields of business and health care. With the goal of getting students into the workforce quickly, the college offers several stellar diploma programs that train students in specific health care fields, such as the Massage Therapy training program, which not only teaches students the basics of Swiss Massage, but also helps students master the business and ethical side of the discipline. Students can also train in specialized medical and dental assistant diploma programs. Everest College is notable among community colleges in Washington for its excellent student services. The Everest Campus' Careers Services Department coaches students in resume building and interviewing techniques, while the CARE Program helps students overcome obstacles with transportation and child care. Additionally, the Igniter Ambassador program trains student leaders to help others navigate the diverse demands of the college experience. One of two Everest community colleges in Washington, Everest College-Tacoma offers excellent programs in health care similar to those offered at its sister campus in Everett. The Tacoma campus offers an outstanding Medical Administrative Assistant diploma program that prepares students to succeed in the daily activities of top medical facilities. Additionally, the campus' Pacific Avenue location puts it in the cultural heart of downtown Tacoma and close to attractions such as the renowned Museum of Glass and the Washington State History Museum. Everest College-Tacoma sponsors several programs that support students and increase access to education. In particular, the campus' GED Program allows qualifying candidates to enroll in Everest College courses and earn their GEDs free of charge. Also, through the CARE Program, Everest College helps students manage personal issues, such as personal budget planning, to make classroom success easier. Already considered one of the best community colleges in Washington, Shoreline Community College is increasingly known for the beauty of its campus. Situated on over 80 acres, Shoreline's green campus is not only blanketed by tall evergreens and colorful flowers, but it also includes a state-of-the-art automotive center, multiple laboratories, and even a child care center. Of course, Shoreline is more than just a pretty campus; the college offers more than 100 academic programs, including associate degrees in disciplines like nutrition and food science and oceanography and marine sciences. With over 40 active clubs and organizations, Shoreline makes it easy for students to get involved. Students can participate in activities like the Ebbtide, Shoreline's cutting edge student newspaper, while sports fans can join baseball, softball, and volleyball teams. For those who don't want to participate on an organized team, Shoreline supports multiple intramural activities and an on-campus fitness center. Bellingham Technical College distinguishes itself from other community colleges in Washington for many reasons, but it's especially notable for its more than 30 associate degree programs covering diverse fields like accounting, nursing, radiologic technology, and more. Particularly notable are the Associate of Applied Arts degree in Culinary Arts, which utilizes the experience of award-winning faculty, and the Associate of Applied Science degree in Dental Hygiene, which enjoys a nearly 100% graduate placement rate. Bellingham Technical College's campus has many notable features, including the Student Lounge which functions as a dual study and relaxation space and even hosts special entertainment events. In addition to fostering academic excellence, Bellingham Technical College works hard to support its community: in 2011, the school joined Achieving the Dream, a nonprofit program that helps low-income students and students of color earn their college degrees. Founded in 1926, Skagit Valley College hosts students on its main campuses in Mount Vernon and Oak Harbor. The college also provides learning opportunities at three satellite centers and administers professional and technical degrees, in addition to academic transfer credentials. Associate degrees are available in a comprehensive range of fields such as education, allied health, automotive technology, human services, office administration, and welding technology. SVC, one of the top schools in Washington, features programs such as the associate in arts in general studies, which is designed for active duty military personnel. SVC's Craft Brewing Academy grants certificates to students as they explore the brewery/distillery business. The Parks Law Enforcement Academy uses an accredited certificate curriculum that is approved by the National Park Service to train individuals in parks law enforcement. Students may also earn one of two baccalaureate degrees: the bachelor of applied science in applied management or the BAS in environmental conservation. Grays Harbor College runs three campuses across Pacific and Grays Harbor counties and has provided local residents with superior, affordable education for almost a century. The college offers excellent transfer associate degrees in fields such as environmental science and occupational therapy. Grays Harbor is also one of the few two year colleges in Washington that also provides a Bachelor of Applied Science in Organizational Management. This degree is aimed at those pursuing leadership positions in a variety of organizations and includes a required internship or capstone project. Grays Harbor is particularly committed to serving the local native American population. With its reservation based "Bridge-Program," the college provides the Native American community the opportunity to complete a transfer Associate of Arts degree via a mostly online platform. Moreover, the Native American Heritage Club promotes equity for the college's Native American population while also increasing awareness about Native American cultural issues. With campuses in Olympia and Lacey, South Puget Sound Community College has been serving the greater Olympia region since the 1960s. South Puget Sound's courses cover everything from the arts and sciences to education, and standout degrees include the Associate of Applied Science in Computer-Aided drafting, which teaches students how to effectively utilize modern technology in the world of industrial design and manufacturing. Students at the Lacey campus can make use of the Center for Business and Innovation, a strategic partnership with the Thurston Economic Development Council that aims to help students develop career competency and even start their own businesses. South Puget Sound Community College sets itself apart from other Washington state community colleges by providing truly superior learning support. In addition to offering traditional tutoring, South Puget Sound's Learning Support Services oversees extensive eTutoring support and free workshops for college placement tests. Located in Port Angeles, Peninsula College integrates the campus and surroundings into the classroom. The school offers associate programs, including the associate of arts, which transfer to four-year colleges in the state. The AA curriculum includes general education and elective courses that are designed to be applied towards a four-year program. The school's professional technical programs include an associate in applied science and an AAS - transfer degree. Certificates are available in addiction studies, business administration, information technology, advanced manufacturing, and medical assisting. PC, one of the top schools in Washington, grants an AAS degree in green building with coursework in carpentry, green building, woodworking, and construction leadership. The AAS in hospitality and ecotourism prepares graduates to work in fields that serve the Olympic Peninsula, which is home to a number of attractions such as Olympic National Park. PC also offers the bachelor of applied science in applied management for learners with an associate degree. Clark College is one of the largest single campus community colleges in Washington that provides for-credit classes. The college fosters numerous innovative degrees, such as the mechatronics program, which teaches students to maintain and repair mechanical equipment that is controlled by advanced electrical computer systems. Clark also supports quality programs in the humanities, and notable programs include the women's studies certificate and the studio art program. Clark College has graduated numerous notable alumni, including major league baseball pitcher Randy Myers and the original founder of the Earth Day celebration, environmentalist Denis Hayes. Additionally, Clark College has the most extensive Running Start program in Washington state, providing almost 2,000 high school students with free or cheap college credits. Students are also sure to enjoy the Archer Gallery, an educational, non-profit art gallery that connects students with professional artists from the community. If you're thinking about applying to one of the best colleges in Washington, continuing reading to learn more about living in the Evergreen State. Washington, commonly called 'Washington State' to differentiate it from the nation's capitol, ranks 13th most populated in the US with over 7 million residents. Although over half of these reside in the western corridor, known as the Puget Sound, the entire state is a wealth of natural beauty and thriving communities, including two major mountain ranges and a primarily untamed coastline. The west boasts a hip, liberal culture and cool, marine weather; to the east, students will experience a bit more 'country', with ample farmland, a drier climate and smaller towns. The cost of living ranges dramatically across the Evergreen State, with metropolitan Seattle being the highest. Students may have difficulty finding affordable housing in this region; the city has countered the problem with a recent building boom of micro-housing, or Apodments, designed for students and urban professionals in need of reasonably priced apartments in the city. As you enter into Central and Eastern Washington, prices drop significantly; those concerned with housing may do better in inland cities such as Spokane or Centralia, which have a much lower overall cost of living. Below we provide an in-depth look at each region so you can know your way around Washington state. Considering the high cost of living in certain regions of Washington, as well as significantly higher out-of-state tuition (nearly triple at the state's flagship institution), students would be well-advised to start the residency process as soon as possible. Individual schools may have additional requirements; take care to check before enrollment. Residency status depends upon their parent or legal guardian. If a student's parents are divorced, the student must maintain primary residence with the parent who lives in Washington. Students must provide proof that the residing parent or parents are Washington state residents to be eligible for in-state tuition and residency status. You must prove that you are not in Washington only to pursue an education. During the first year, if you're taking more than 7 credits per quarter, you must also work outside of campus for a minimum of 30 hours per week. You must also live in the state for 12 months as a legal resident, meaning all ties with your previous state of residence have been relinquished (driver's license, etc.). You must then establish legal ties to Washington, such as steady employment, state ID or driver's license, vehicle registration and so on. If you're under 25, you must also prove financial independence for both the current and previous calendar year.